On September 21, Consul General Hong Lei met with the Des Moines Register President David Chivers and Engagement/Opinion Editor Lynn Hicks in Des Moines, the State Capital of Iowa. Consul General Hong Lei said that Iowa is friendly to China and is China's important partner. Governor Branstad attaches great importance to Iowa’s relations with China and supports exchanges and cooperation between Iowa and China in various fields. Cooperation between the two sides in trade, investment, culture and education has continuously made new progress. China has become Iowa’s third largest trading partner and export market as well as the largest origin of international students. Consul General Hong Lei said that currently, China-US relations have maintained steady growth. Earlier this month, President Xi Jinping met with President Obama during the G20 Hangzhou Summit. The heads of state reached important consensus on further building a new model of major-country relationship between China and the US. China-Iowa cooperation will have more opportunities. 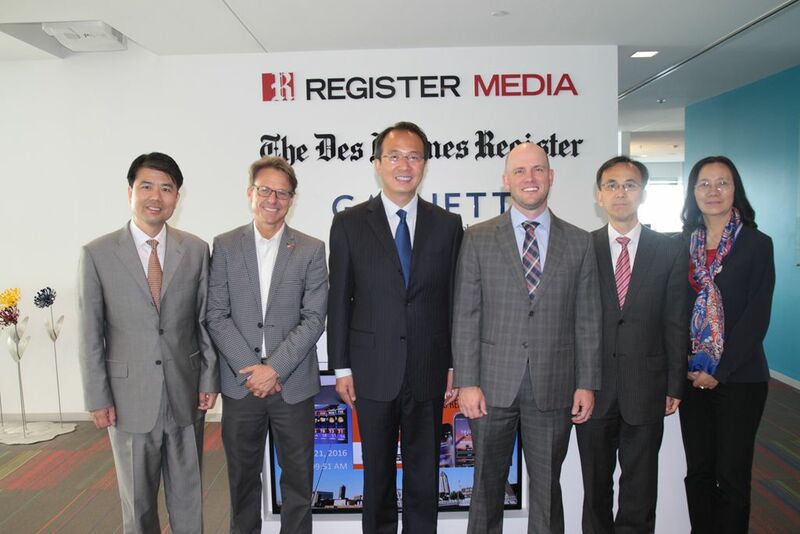 The Consulate General hopes that the Des Moines Register, as one of the most influential newspapers in the Midwest, can pay more attention to China and China-US relations and cover more wonderful stories of China’s development and China-US cooperation. Consul General Hong Lei also answered questions about youth exchanges and bilateral trade between China and the US. President Chivers welcomed Consul General Hong Lei and said that the Des Moines Register follows closely on economic, trade and cultural cooperation between Iowa and China and supports the development of US-China relations. The Register will keep in touch with the Consulate General.